← The Ultimate Coffee Info? 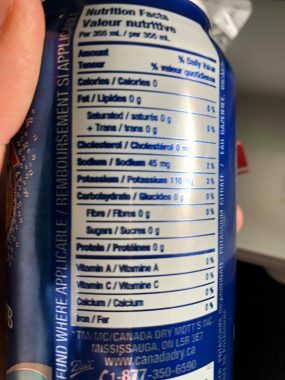 I answered a question on Quora, mostly from memory the other day, and it led me to double check the differences between Club Sodas and Sparkling Waters. My contention is that sparkling water is generally a bottled mineral spring water, and therefore contains various trace minerals, but most usually sodium (Na) and calcium (Ca.) The most popular sparkling waters come through limestone and to my surprise actually can bubble to the surface carbonated. I stayed briefly in an ex-monastery converted to hotel in Tuscany, that had two pipes in the courtyard, running at all times. The one on the right was still mineral water and the one on the left was sparkling. When I inquired the springs had been running since time immemorial, and likely were the reason the spot became ‘holy.’ They made no effort to bottle it, just let it run out of the well and back into the ground. 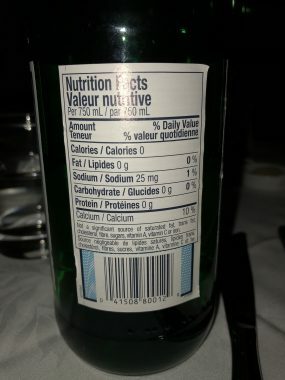 In any event here are two products labeled according to Canadian food laws. As you can see the one on the left has nothing but sodium and potassium and water in it, and the one on the right has a substantial amount of calcium. I probably need to add a category for the new designer waters – additional vitamins, and I expect somebody is adding minerals too, as they are a nutrient. This entry was posted in Wine and tagged club soda, sparkling water. Bookmark the permalink.